Our next Tequila Dinner will take place this coming Thursday, October 22, and will begin promptly at 6:00 in the evening. For past dinners, we’ve served up Azunia and Milagro tequilas, so for this one, we’ll be serving Patron. For just $40 per person (or $70 per couple), you can enjoy an appetizer, meal, dessert, and tequila sampling. This coming Thursday, we’ll be pairing Patron with a delicious grilled chicken taco salad with queso fundido, which incorporates four different cheeses, along with jalepeño, chiles, and onions for a huge flavor boost. We’ll also be serving fried avocado with picante salsa, queso fresco, and chipotle crema; if you’ve never had fried avocado before, you’re missing out. We coat ours in Japanese breadcrumbs and lightly fry them so that they’re nice and crispy without losing their flavor. We’ll also be serving up some Mexican roasted corn served off the cob. All of our Tequila Dinner meals are designed and prepared to complement the taste of the tequila you’re being served, so these dishes will go great with your Patron sampling. And we’ll also be having a special guest chef in the house during the Tequila Dinner on Thursday, November 5th, so you don’t want to miss it! Eric Justice is the co-founder and board member for Chefs4Kids, an organization that raises money for children in need. Eric Justice began his career as a businessman, but has since forayed into culinary arts. Having earned a culinary arts degree in 1993, he went on to become a successful consultant and restaurateur. We’re proud to be having him in our kitchen assisting with this upcoming Tequila Dinner! Due to the popularity of our Tequila Dinner events, we do require advance reservations, so be sure to secure your seat today by giving us a call and booking yours. And if you can’t get enough tequila, you can also check out our Ultra Premium Tequila Window at the bar to sample nine other tequilas that we have available. We also have a new menu that we’ve just recently debuted, so even if you’re unable to make it to our Tequila Dinner, we encourage you to drop by and give some of our new menu items a try. For those who can’t make this dinner but would like to attend one in the future, we have two more coming up on November 5th and November 19th, respectively. 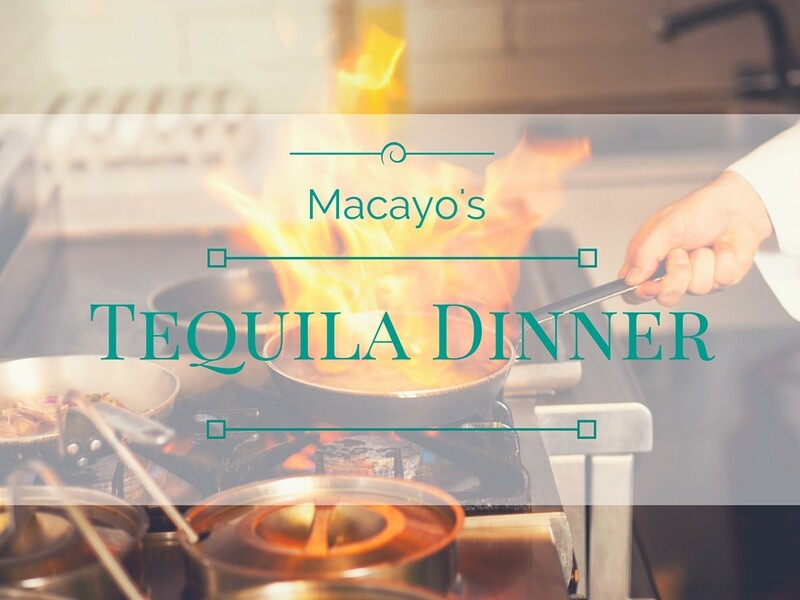 We look forward to seeing you at Macayo’s for what’s sure to be a great time with delicious food and tequila!